After almost a month of exciting and attractive football, the end game approaches. It's going to be Spain against the Netherlands in the final. As Vicente Del Bosque's high flying La Furia Roja side get ready to take on Bert Van Marwijk's industrious and effective Oranje at Soccer City Stadium in Johannesburg on Sunday, rediff.com takes a look at a few players who can make a difference to the eventual outcome. Make no mistake, all 22 players present on the field on July 11 will be crucial to their team's fortunes but here a few who might just tilt the scales in their team's favour. Before this World Cup David Villa was the second in command. The Barcelona player, despite his extraordinary scoring record for Spain and a Golden Boot at Euro 2008, was living in the shadow of strike partner Fernando Torres. However, in this World things have changed. Blame it on his irresistible form or Torres' lack of it, if one Spanish player has shone the most in South Africa it is the guy they call El Guaje (The Kid). The 28-year-old has so far scored five of Spain's seven goals in the competition and, along with Dutchman Wesley Sneijder, leads the race for the Golden Boot. In doing so, Villa has time and again, demonstrated an ability to conjure something out of nothing that marks him out as one of the game's great talents. 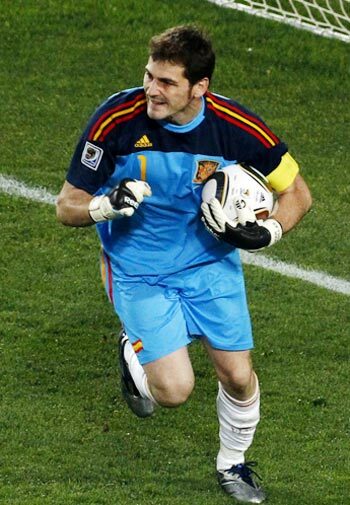 Villa's goal tally for La Furia Roja now stands at 43 in 64 matches, just one short of Raul's all-time record (44). Had it not been for a missed penalty in the Group H clash against Honduras at Ellis Park, Villa would have needed just a goal in the final to surpass the Real Madrid legend. For the Oranje, Wesley Sneijder is easily the player of the tournament..
Sneijder, cast off by Real Madrid, found that even as a Champions League winner with Inter Milan the world was more interested in Arjen Robben. However, the 26-year-old didn't let that deter him. And now the Netherlands playmaker is on course to clinch every trophy he played for this season. Sneijder won the Italian double and Champions League with his club, Inter Milan, and now is set to feature in the World Cup final and could even end the tournament as top scorer. "This is a great achievement and wonderful thing for the Netherlands, winning six matches in a row (at the World Cup finals) and now we have five days to prepare us for one more 90 minutes," Sneijder has been quoted as saying. "This is so special. I experienced it already with Inter, playing a final is special and you must savour the moment as it doesn't happen very often. "I have told my team to savour it and enjoy it then give it all you've got," he added. He was the man of the match in the semi-final. Xavi was at the heart of Spain's best attacks, spraying the ball to the flanks and firing long penetrative, passes as German heads sagged. He also delivered the corner that Carles Puyol headed powerfully past Manuel Neuer to hand Spain their first World Cup final appearance in 13 campaigns. The Barcelona player has praised the performance of his team mates, saying, "I'm very happy. I think it was deserved. The team did a great job. We dominated the match and the Spanish personality imposed itself." But if there has been a decisive factor in Spain's wins in the tournament, it is Xavi, always bossing the midfield with his experience and talent. Arjen Robben is a player to watch out for. Whether by scoring, creating or drawing fouls, the 26-year-old is the key weapon for the Oranje. Having missed most of the group stage he was recovering from an injury Robben, who won the double with Bayern Munich besides helping the German side to the Champions League final, has scored twice in three matches. His first goal was a trademark left foot strike against Slovakia in the round of 16 while his second came in the semi-final. Robben scored with a perfectly placed downward header after Dirk Kuyt's cross from the left to ensure his side's passage to the final. If Spain harbour any hopes of the title, they have to keep this tenacious winger at bay. Along with Xavi, Andre Iniesta is one of the main pivots of the Spanish midfield. For Barcelona, Iniesta and Xavi are among the best in the world at threading passes past defenders and bamboozling opposing midfields. And the duo seem to have translated the impact into this World Cup. How else do you explain the stifling of a German team that had score 13 times ahead of their semi-final. Iniesta and Xavi were the proponents of passing carousal, were all over the centre of the park, untirelessly holding the ball, supplying and taking shots themselves. And they made sure the Germans didn't have the ball. It is often said that the Netherlands' strength lies in their attack, with the 'Big Four' -- as the Dutch media call them -- of Robin Van Persie, Wesley Sneijder, Rafael van der Vaart and Arjen Robben, the key to their success. The saying is akin to belittling the contribution of the industrious Dirk Kuyt. Kuyt may lack in creative flair but more than makes up for it with the hard work. The Liverpool player does sometime get upset about the same. But never does he let this affect his game. And he has been one of the best players for the Oranje in this competition. No wonder his coach, Bert Van Marwijk, is all praise for the 29-year-old. "I read somewhere that when Rafael Benitez picked a team at Liverpool, he wrote Kuyt's name down first. 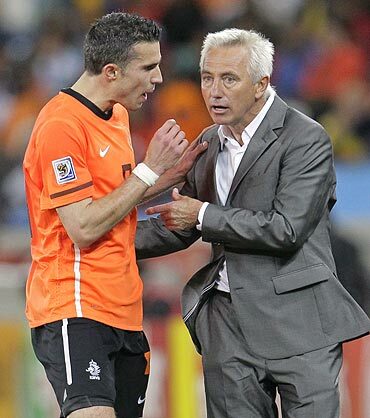 That says everything," Van Marwijk said recently. "Every player has a period where things don't work out and Liverpool had a very tough year, but Kuyt is extremely important for us. The way he plays shows his passion and enthusiasm, and it is catching," he added. The words above everything about Kuyt. Don't they? He is the best goalkeeper in the world. And a good captain as well. But Iker Casillas had to do a lot of explanation at the start of tournament, particularly after Spain's opening loss to Switzerland. 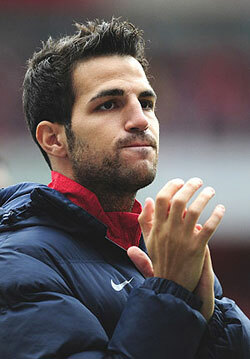 It was said that he is distracted by the pitchside presence of his television presenter girlfriend (Sara Carbonero). Casillas had to explain himself in a live interview with Carbonero immediately after but has since silenced his critics. Striker Robin van Persie netted four goals in three warm-up games and said he wanted to do more than just score goals in South Africa. "Every striker is judged on the goals he scores, but I want to give more to the game. I'd be happy with more assists than goals," he said. "That may sound odd, but that is my ambition because it will make the team better." However, he has disappointed so far in the tournament with the Oranje goals conveniently coming from a wide variety of sources than the rusty striker who is still playing his way back to full fitness. Van Persie has scored just one goal in the six victories leading into the final. However, the Aarsenal star isn't disappointed. "A few people were a bit sad that I didn't score, but football isn't always about scoring. Of course I want to score goals, I want to score ten, but I am happy with my own performance," he was quoted as saying after the semi-finals against Uruguay. And his coach Bert Van Marwijk believes the striker has saved his best for the final. "Robin has really improved during the last few matches and I still have a lot of confidence in him," he said on Thursday. "I think he will show his best football in the coming match." This is a strange choice. And in this World Cup Cesc Fabregas has been somewhat of a dark horse. But the Arenal player has said he was concentrating on staying focused and waiting for his chance. "The important thing is to motivate yourself and believe you will make it on to the pitch," he has been quoted as saying. "You have to be able to feel ready to contribute. If you are not on the pitch then okay just celebrate with your team mates and enjoy it." And it would be a mistake not to believe him. Remember his Euro 2008 exploits?